Hell No, Tumblr Users Won’t Go To Yahoo! We’ve all by now heard about how Yahoo is trying to get some “cool” with a supposed $1 billion purchase of hip blogging platform Tumblr, but it may be a moot point if Tumblr’s users fail to stick around post-sale. Microsoft and Facebook may be trying to make a move ahead of Yahoo, Tumblr may be inching ever closer to running out of cash, and (despite that) may not be afraid to play a little hardball. But here’s something you’re not hearing much about: Tumblr’s users are almost universally unhappy with the news that the site might get sold to Yahoo. And they may let their fingers do the talking, and the walking. Do a search on Tumblr for “yahoo” and you get a stream of distress, interspersed with the occasional bit of helpless resignation, and some calls for activism. The voices of reluctant acceptance (usually because of the aforementioned cash situation) or anything like positivity are few and far between. No outright enthusiasm. It’s a problem that extends to some of Tumblr’s oldest users. Some have tried to start a petition, with a goal of 5 million signatures, although others are cynical about whether this will actually have any effect. User attrition is not something to be dismissed, especially when it appears to be underpinned by wider usage trends on the site. When I wrote a post in January about what might come next for Tumblr as a business (it focused on how it could make money; not how it might need to get sold because it doesn’t), I noted that in the prior month, December 2012, it had 167 million visitors and nearly 18 billion pageviews worldwide (Quantcast figures). The trend over the last six months are down, however: in the U.S. page views are down 21% to 5.3 billion, and uniques down 5% to 76 million. 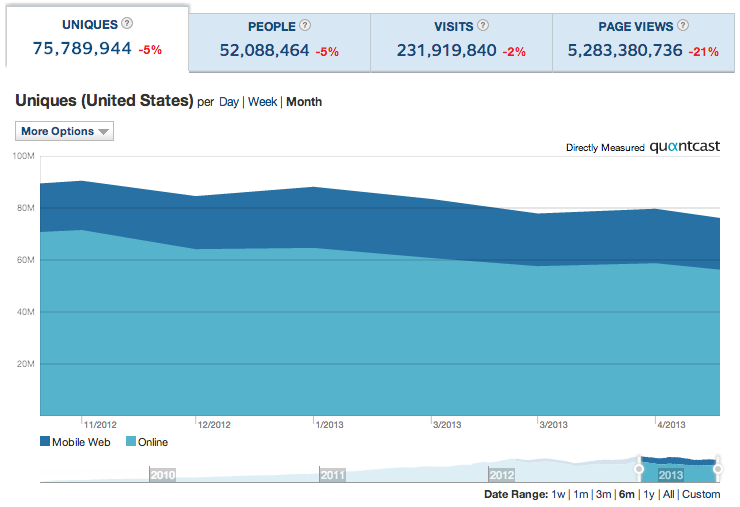 Worldwide the picture is better but still not growing: pageviews are down by 4%; uniques are down by 3%. Not a sinking ship, but not a zippy little speedboat, either. Yahoo’s MySpace, indeed.